New website: it’s time for a change! Check it out! 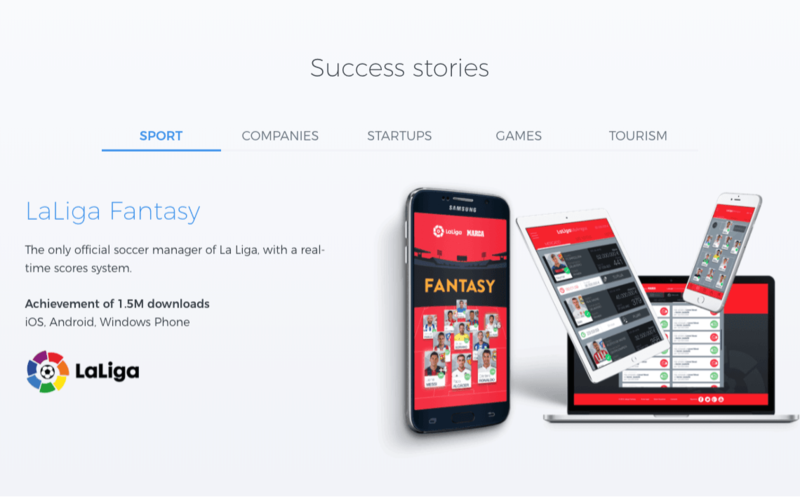 Home » Yeeply News » New website: it’s time for a change! The world of mobile applications is one of the most dynamic sectors at the moment. And that is exactly why it’s necessary to adapt and change quickly to the movements and innovations that are occurring. At Yeeply, our mission is to offer services and solutions adapted to our clients and the market. In order to keep improving this, we decided to launch a new website that is satisfying the needs and wishes of our users (even more). High quality: our experts are certified in various technologies and programming languages. They have worked on various projects and projects are only assigned to them if they match their skills and expertise. Technical control of the project: the projects are monitored by a project manager, who is responsible for managing the project on technical level and ensuring that deadlines are met. Availability of resources: we never run out of resources. Many companies with multiple projects prefer to work with us than look for an alternative supplier. Time before starting the project: we only need a few days to determine the key points of the project in order to start developing it as soon as possible. Final cost: thanks to our experience and process optimisation, we can reduce our costs and ensure that the money of our clients is well-invested. Know-how technology: after completing 400+ projects, our knowledge has extended. This enables us to provide a broad vision at technical and business level. Firstly, you need to define your project. This means you will need to describe it as detailed as possible and attach all the significant information. After publishing your project, you will receive a price estimation within 24 hours. From this moment, a commercial specialist will be responsible for answering any possible questions from your side. Secondly, you will have to accept the proposal to proceed with the process. Our matching algorithm will take care of finding the right team of developers for your project. After this, we will send you various proposals, including: the final price, delivery dates, functionalities, guarantees, maintenance and conditions. You are free to accept and sign the proposal you feel most comfortable with. After completing the first two steps, the process of development will start officially. Besides a commercial specialist, there will also be a project manager assigned to your project during this process. However, you will receive and evaluate the partial deliveries, until the end of the project. We offer technological solutions to large brands and multinationals of any industry. In order to get a better impression of the projects that we completed, we created a new section called “success stories”. In this section, we provide you with more information about the websites and mobile applications that we created for specific clients. In order to get a better overview regarding cost calculations, we added a selection of our latest developed projects. Although the name of our client is left out because of secrecy reasons, we provide information about the platforms, description and type of the project, price and delivery time. Hopefully, this will help to get an idea of the estimated costs for a project. Besides our external websites “How much does it cost to make an app” and “How much cost a website”, the client is now able to calculate the estimated costs of a project with an internal calculator on the pricing page. In order to improve our customer service, we created an integrated chat function on our webpage. In case a user has a question, he can first take a look at our new FAQ section, where the most common questions are answered clearly. If the answer can’t be found here, you can ask the question to one of our employees through the chat function. This way, we can ensure our users they will get the answer they are looking for. 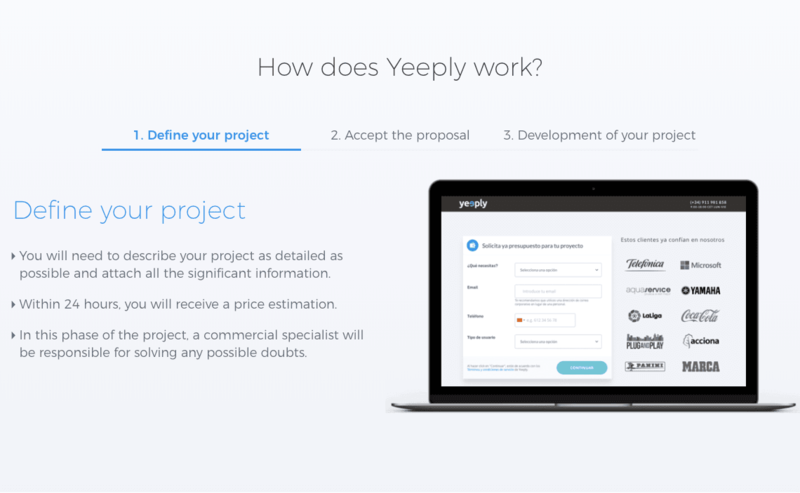 Last but not least, we added an “about” section that is telling the story of Yeeply and where it’s possible to get to know the team. Furthermore, we decided to change the design of the entire website to make it more attractive and professional to our visitors. Curious about the new design and content? Check out our new website!